The Gnome Grown dispensary in Oregon City displays cannabis products in an upscale arrangement. Full of light and tailored with unique, quirky details, Megan Stone’s luxurious interior designs feel more like spas or five-star restaurants than old-school dispensaries. That’s because every aspect of the experience has been thoughtfully designed and honed to aesthetic perfection. In the early days of cannabis dispensaries, design wasn’t a big factor. 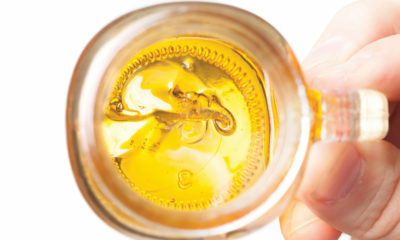 Most dispensaries were small, dark rooms with display cases full of cannabis. You’d enter into a highly secured waiting room, check-in through a window of bullet-proof glass and wait for a security guard to open a thick metal door into the windowless retail space. The experience felt more like visiting a prison than going shopping. These days, all of that is changing. As cannabis legalization continues to create a more legitimate commercial industry, dispensaries are becoming retail storefronts and are working hard to set themselves apart with innovative and elegant designs. Stone and her company High Road are at the forefront of this high-end design movement. 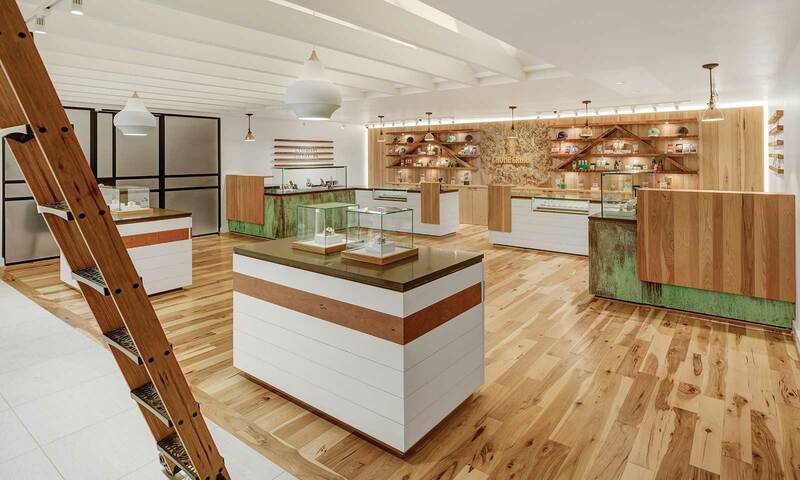 Megan Stone uses themes to tell a dispensary’s story within her interior designs. At Gnome Grown, a gnome appears in several different places within the dispensary, including the door handle. Stone first noticed the need for cannabis-specific designers while working at as the general manager of two dispensaries in Orange County, California during design school. “Walking into a dispensary was supposed to be the coolest shopping experience I ever got to have, and yet it was really one of the most anticlimactic and biggest let-downs,” she said. Noticing that there weren’t many designers specifically focused on designing the interiors for dispensaries, she then decided to launch her own business focused on just that. The results have been incredible. Stone’s designs (which can be found in dispensaries across the country) are a big departure from dispensaries of the past. Some examples include TruMed, a hip hash bar in Arizona, and Minerva, a New Mexico dispensary dubbed the first cannabis mall. Gnome Grown dispensary in Oregon City features an open floor plan and light color palate to make visitors feel welcome. High Road starts to work with clients by focusing on what makes each dispensary unique. “Once we land on that particular different, unique, authentic part of their story, we build the entire brand and retail experience around that,” Stone said. The next step in the process is interior space planning, which Stone says is key for cannabis retail. Departing from the small, security-focused waiting rooms of the past, Stone often works with frameless glass partitions to create space and transparency in her designs. 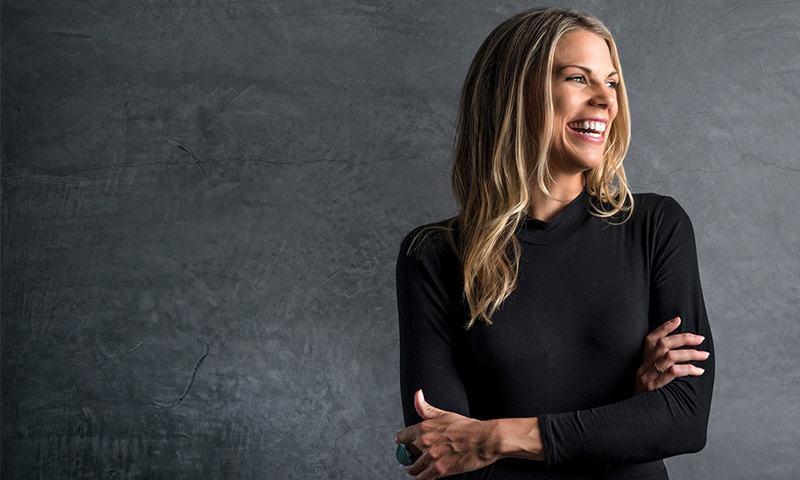 Through her company High Road, Megan Stone works on creating beautiful interior designs for cannabis dispensaries across the country. Photo by Caleb Alvarado. “I think having that sense of openness helps the psychology of the environment,” she said. Stone also has to make sure that her layout works for practical concerns such as incorporating local security regulations and best practices for preventing theft. With the layout complete, she then moves onto the aesthetic design, weaving the “brand story” into the space with personal touches and details. When it comes to previous design projects, Stone says she loves those that are based on a personal story. After the design, the High Road team oversees the process of putting it all together and stays involved once the store is open to ensure every aspect of the dispensary’s business (from marketing material to branded swag) is seamlessly integrated into the aesthetic. “The power of design in changing perceptions and influencing behavior is a force the cannabis industry must not underestimate,” she said. TELL US, what makes you feel at home when you’re visiting a dispensary?